Whitehall E-45-S Stationary Whirlpool is recommended for treatment of the upper extremities and the lower leg below the knee. Tank Capacity is 45 gallons. 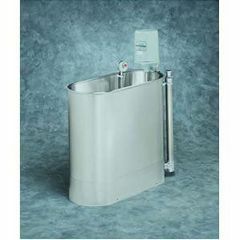 Whirlpool Tank is 32”L x 15”W x 25”D and is seamless welded construction, fabricated from heavy gauge, type 304 stainless steel, polished to a satin finish. Tank rim is reinforced with a concealed stainless steel rod. Tank bottom is seamless, rounded coved design to minimize bacteria buildup. Tank isalso provided with an extended stainless steel skirt flush to the floor line to conceal internal drain piping.